The Internet is generally seen as a global network without borders. Unfortunately the media industry and especially their licensing model seems to be still stuck in the past where markets could be basically geo-fenced. Here is a personal view on what this means for customers. Personally I am generally interested in streaming video or media. Flat-rates for such media are especially appealing if the underlying collection of media titles is interesting. In the past I also briefly joined Maxdome when they started in Germany. Stopped it then because the titles available in their flat-rate library were mostly rubbish and the titles for rent were crazy expensive. I am a regular customer of Apple (either buying or renting media). There was usually no problem with that . Apple somehow managed to get a very large library of interesting titles together. It is however currently only possible to rent or buy the media. Prices and available content are different by region. So I used two iTunes accounts: one in Germany and one in the United States. The U.S. iTunes library is much larger than the localized German version. Originally it was only possible to get original TV shows and movies in English if you bought them in the U.S. iTunes. Over the years this has improved a lot and now new releases are also quite quickly in Germany – even in the original language. But there seems to be still a delay usually. The USD prices are also lower and they are often much more willing to offer promotions (like for example the first episode of a new series for free). But I nevertheless did not use my U.S. iTunes account at all for probably two years or so. I also briefly joined Watchever when they started in Germany some years ago. When I lived in Switzerland I could not use Watchever anymore since they geo-block access from any IP address coming from that country. Same applies to Watchever, HBO and Netflix. They all do not want customers from countries where they are not locally present. I am not willing to pay extra money to carmouflage my current real physical location just to be able to access a service I am already paying for. VPN makes it so much more complicated. I would love to access media on my TV, phone, tablet or computer. Do not want to setup VPN on all of them. Tunneling all traffic through a VPN on my home router is also no option because of point number three. The VPN provider then serves a “man-in-the-middle” for all communication. They can see all data going through the VPN tunnel. Personally I have bigger trust in my local internet provider since they need to adhere at least to certain data protection and privacy standards. I have not found any VPN provider I would consider reputable enough. Unfortunately I do not have my own rack space in the U.S. where I could set up my own VPN hardware. Some media providers have started to block the usual VPN providers. So I would be part of some kind of cat and mouse game while paying for both providers. I have also reviewed local streaming media providers in Switzerland (latest check was mid 2014). But I did not like any of them. Often they were very expensive and thus unattractive compared to rent/purchase in iTunes or others. Usually they had only limited libraries of meda titles. Especially recent TV shows or movies were often not available. The most interesting providers are linked to a certain carrier. So you for example can only use the Cablecom media streaming if you buy the Internet connection from them. As a consequence of all the above, I have not been a customer of a streaming media provider in the past years. Things changed a bit when I moved back to Germany end of 2014. There are quite a number of players in the market. The prices are also much lower than in Switzerland. 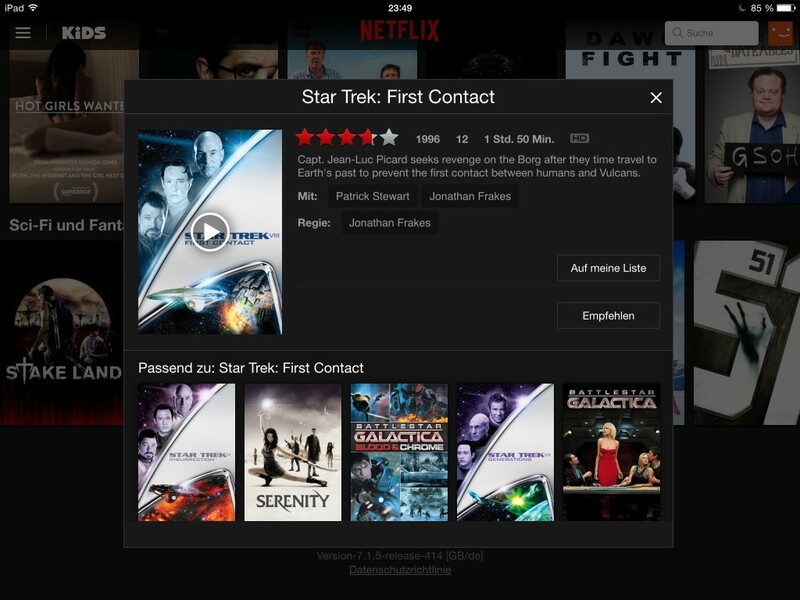 I joined Netflix immediately when they started in Germany. Main reason was to watch the new third season of Game of Cards. I bought the previous ones on iTunes. 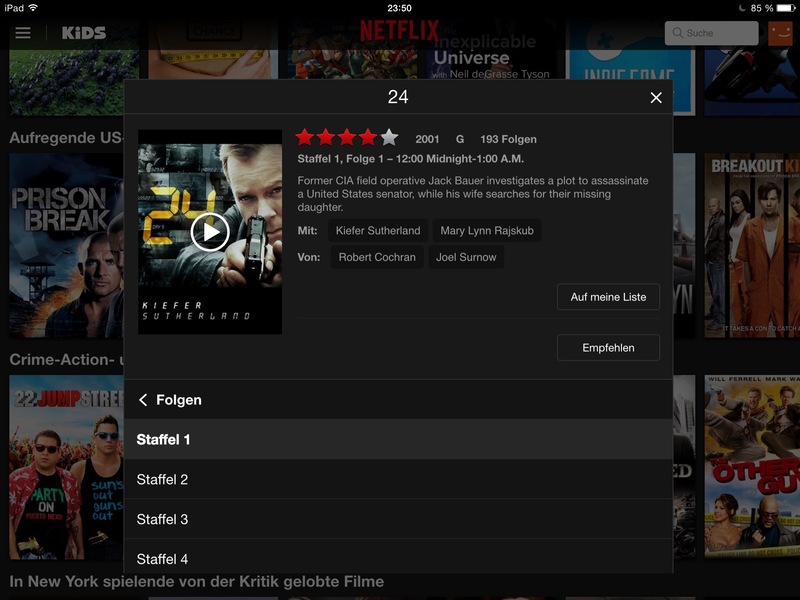 To my surprise this “Netflix Original Series” was not available on Netflix Germany (this has changed since September 2015 and it is now also available in Germany). Even bigger was my surprise when I travelled through England in May 2015 that I could see Game of Cards in the menu and could also watch all of the episodes. Here is a screenshot from my Ipad. 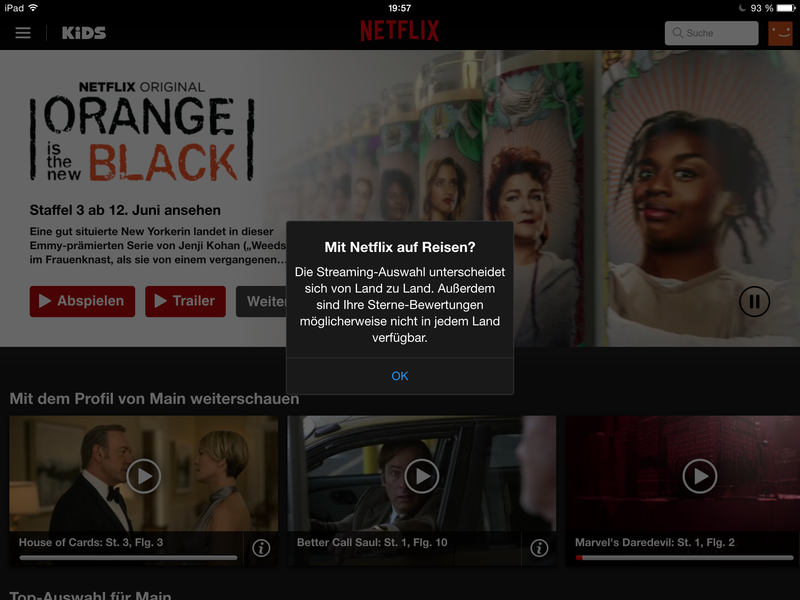 It says (in German) that the available streams may vary by country while I am traveling. So my German user account, paid in Germany through a German bank offers sometimes a better or worse value for money depending on where I am. So much for the global internet without borders. In Switzerland its value would be zero because I probably cannot access it at all. Netflix UK also includes some blockbusters like the US series “24”. As you can see (in a funny combination of English and German) that season 1 was shot already in 2001. So far it never made it into the library of Netflix Germany (status May/June 2015). The entire StarTrek stuff is another nice example. Seems the German audience is willing to still pay enormous amounts for buying or renting this. So it somehow never made it into the library of Netflix. In the UK you can get all of this stuff as part of your normal monthly flat rate with no additional charges. I do not really blame Netflix for this. This also applies to other providers. The real issue is probably the outdated licensing model for media. Media producers like the film studios have split the globe into regions and want to manage their licenses according to this virtual grid. Reminds me of the old days where you could not play DVD bought in the US in a European DVD player. A lot of effort was spent to create artificial barriers to avoid global trade. Instead of region codes, you now have geofencing or geoblocking. Depending on your public IP address (which is by the way also not really necessarily bound to the geographic location where you are) you can either play or not play the media you have paid for. This is seriously silly in times of global networks and ubiquitous computing. Dear media industry, you spend a lot of time and effort on geo-segmenting the world and setting up virtual fences around your sales grids. May I suggest that you invest that money in a general licensing approach for the whole planet? I simply do not want to care about my location when having the desire to watch a movie, series or something else. Even if this means that some local media licensing agencies will die and thus jobs will be lost. These agencies are a thing of the past and it makes no sense to keep them just for the sake of protecting old empires. At the moment you make using your media so complicated and annoying that it is often probably easier and more convenient to just download an illegal copy. I am happy to pay you for the content. Know that it costs you a lot of money to produce it. But please do not punish me for trying to comply to your crazy intransparent rules.